Over the past three months, I’ve been on a real fruit obsession. Fruit smoothies, shakes, muffins and jams galore! If you remember, I even put blueberries in a cookie (OMG so good!). One fruit I’m absolutely in love with are the organic braeburn apples from Trader Joe’s. They’re one of my favorite healthy snacks especially when dipped in peanut butter or vanilla greek yogurt. I feel so lucky when I find them because they have the sweetest flavor and best crunchy texture. Lord knows I’m already excited for apple season so I can bake up my famous apple crisp and warm up some hearts. Since we’re not into the Fall season just yet, I felt like it was a little too early to start busting out apple recipes. So today I’m bringing you a healthy, lightened up whole grain scone bursting with the sweet blueberries I found at my local farmer’s market earlier this summer. They’ve been in my freezer for the past month and I was eager to use them up! This was actually my first time experimenting with scones and it definitely won’t be the last. The crumb was quite perfect– so fluffy and moist from the greek yogurt. The outside has a lovely crunchy texture that was irresistible; it tasted like the top of a blueberry muffin. The best part is that these healthy ones absolutely melt in your mouth just like a buttery scone would. Try dipping them in a little coffee. TO DIE FOR. I thought about glazing them, but they’re quite perfect as is. 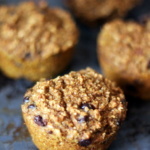 Not too sweet, but something that you could enjoy for breakfast or packed for a guilt-free lunch or snack. I used just a bit of butter in these, but you could try using coconut oil instead. I don’t see it making much of a difference. Jazz up these scones by adding a squeeze of fresh lemon juice or some vanilla beans. 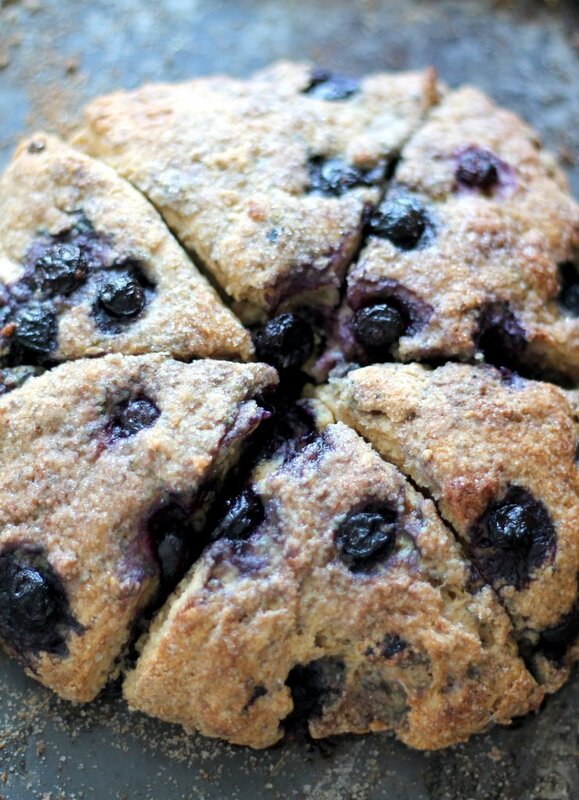 A healthy blueberry scone made with whole wheat flour and greek yogurt! In a small saucepan, brown the butter over medium high heat. If you are unfamiliar how to do this, I've created a step by step tutorial. If you don't feel like browning it, you can just melt and cool the butter, or use softened butter. In a large bowl, whisk together both flours, brown sugar, baking soda, baking powder and salt. In a small bowl, combined greek yogurt, vanilla, butter, and egg white. Add wet ingredients to dry ingredients and stir until just moist. Mixture should be crumbly. Gently fold in blueberries. Turn dough onto a lightly floured surface and knead about 8 times with your hands. Dough will begin to come together. Form dough into a 6-8 inch circle and place on baking sheet or parchment paper coated with cooking spray. Cut into 6 wedges and barely separate. To make the topping, combine sugar and cinnamon. Spray the top of the dough with cooking spray then sprinkle the top of the dough with the cinnamon sugar mixture. Bake for 15-20 minutes or until top of the scones are lightly golden brown. Feel free to use a flavored greek yogurt. Try adding raspberries or strawberries instead of blueberries! You can also use dried fruit. 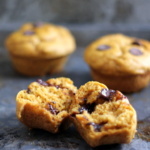 Healthy Chocolate Chip Sweet Potato Muffins + video! 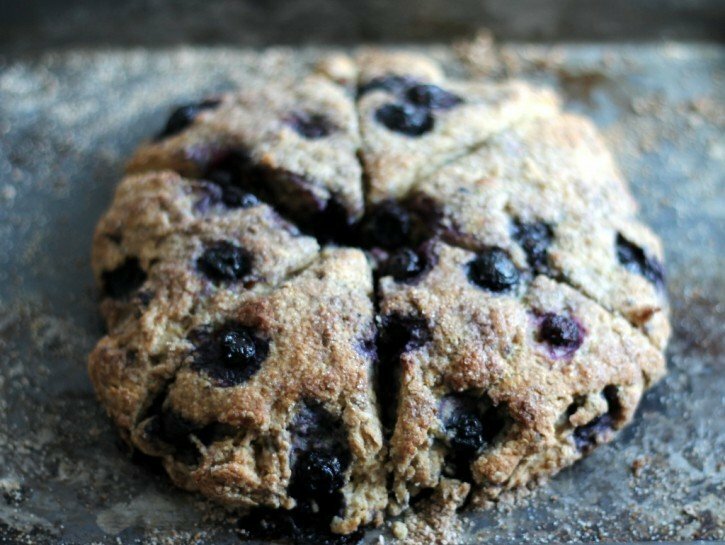 52 Responses to "Healthy Blueberry Greek Yogurt Scones"
I’m going to try this tomorrow, d’ya think i can use the whole egg? And were these hard or soft (I never seem to make scones soft and flaky like the should be- but this is the first time with Greek Yogurt)? A whole egg should be fine. They are soft but have nice crunchy tops. Monique, I just love your blog! I have made countless recipes from your site over the past year or so and they’ve all been winners. 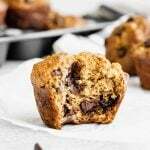 Tonight, when faced with a last minute dilemma of what to make for healthy staff meeting snacks tomorrow morning these were whipped up quickly and are so delicious! I may just have to make another batch though because my husband and I have decimated the double-batch sitting on the cooling rack. You, your recipes and your blog are so inspiring, keep it up! Yes mine was done about sixteen minutes, set the timer for 18. I also was brave and did a tablespoon of coconut oil with the two tbsp. of butter. Thanks for a healthier alteration recipe! Another winner! Doubled the recipe, used whole eggs and frozen blueberries. 20 minutes was a touch too long in my hot oven, as they were a little too brown, I should’ve checked at 16-18 minutes, but I should know better. They are delicious and I’m taking them to a friend’s for brunch. Can I use 2% fat greek yogurt for this recipe? It’s all i have in my fridge and I want to make these in the morning! Hi Monique! Thanks for a great recipe. I’ve made these twice now and my family really enjoys them. In fact, we like them so much, I wrote about them on my own food blog (giving you credit, of course! 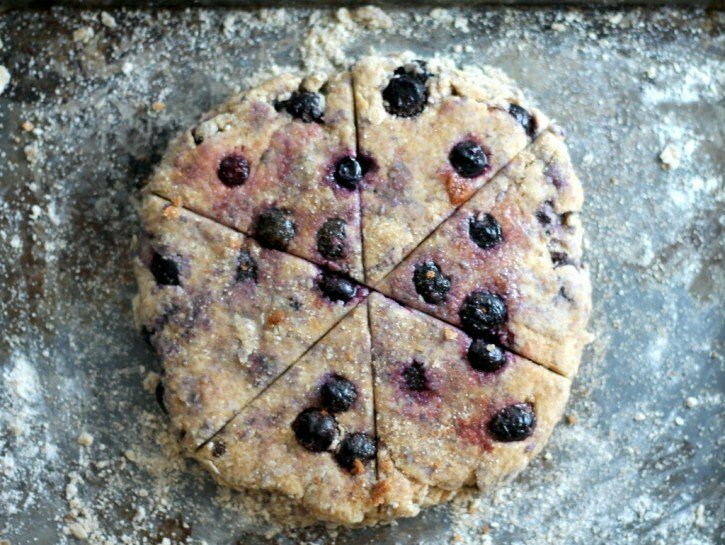 ): http://alovelettertofood.com/2015/09/blueberry-scones/ Can’t wait to check out more of your recipes! Hi Monique, these look incredible! Do you think I can replace the all purpose flour with white wheat flour? So that it’s all whole grain. Thanks! Of course. I actually recommend whole wheat pastry flour. I made these and they turned out so good!! Can’t believe they actually turn out like a real scone. Next up, I was thinking if I can replace the the butter with applesauce.. Would that be out of the question? Or worth a try.? I made these scones, and they are my new fave! I used the whole egg, my own homemade yogurt, and chopped frozen cherries. I used a box grater to grate frozen butter and worked it into the dry ingredients instead of using melted butter. My wife says they are the “most professional” scones I have ever made. Thank you for a great recipe. I’m thinking about the variations. Parmesan and herb, sausage and cheese, Apple/blueberry. Hey! I made these tonight and they are delicious. It was my first time making scones. Thanks for the recipe! 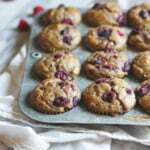 Could I use oat flour instead of the white whole wheat?? I would love to follow the recipe but don’t want to have to go to the store tomorrow to get anything! I love the flavor of how these scones turned out, but I found them to be very dry. Do you have any recommendations of what I could do to rectify this or why this might be the case? Thank you! 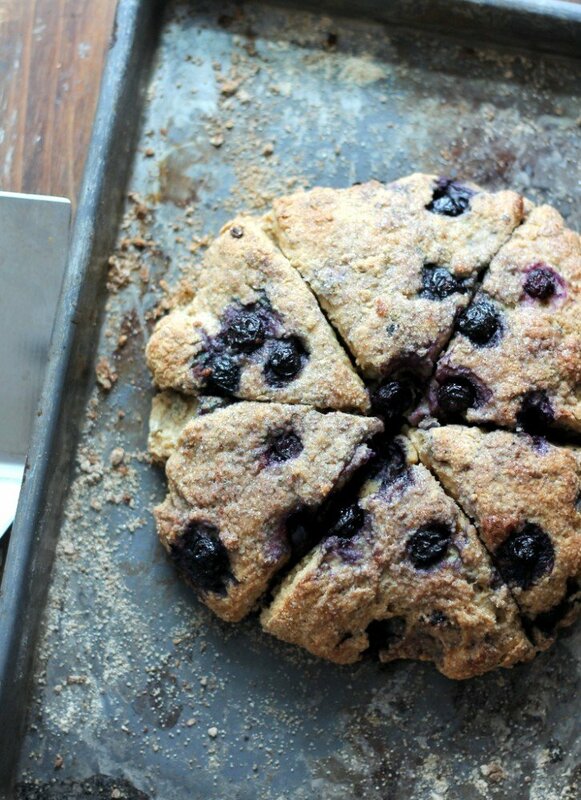 This is one of the best healthier scone recipes I’ve ever tried! These were even more amazing than I expected. I used the whole egg, and I love that they have whole wheat flour and greek yogurt. Thank you! I mixed the zest of 1 orange and 1 tiny lemon into the sugar before adding it and subbed whole grain oat flour for the whole wheat pastry flour. The scones are amazing! The cook time is much too long. They were perfect (bordering on too dark) at around 16-17 minutes. Thanks for the recipe. I used coconut oil no butter. I also used coconut sugar instead of brown sugar. I added zest of half a lemon and also 2 T lemon juice. I also added 1/4 cup shredded coconut and a T of whole flax. I baked @375 for about 20 minutes and I skipped the sugar on top and drizzled lightly with lemon juice powder sugar glaze. Hope this helps. They were really delicious and I make scones often but have never made with melted fat instead of cutting the far in so ?? Just made these yesterday and there’s literally only one left!! SO delicious and love the healthy ingredients. thanks for this recipe. i’m just waiting for my batch to cool before i have one for a bedtime snack! Hi! Do you know how long these scones will last in the fridge? I’ve made these scones as the recipe calls for and they were delicious! I wanted to make them again, but don’t got any Greek yogurt. Is it possible to sub in applesauce ? Here are some magical suggestions! 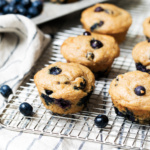 use WHOLE WHEAT flour and FRESH blueberries, make sure to mix the blueberries at the very end so they dont come apart and smuchy and 1 TEASPOON of vanilla and 2 EGG WHITES, make sure to BEAT UP the eggs whites first before adding the rest of the ingredients! I wish I can upload a pic! they came put amazing. Yum! I made these for an Easter treat with dried blueberries (no fresh ones here in Southeast Turkey!) – I used a whole egg and olive oil instead of butter – and my craving for something decadent yet still healthy was sated! Thank you so much! Hi! I do not have whole wheat pastry flour or white whole wheat flour, is it okay if I use self-rising or all-purpose? 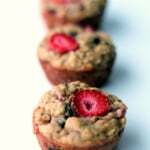 I just made these with all white whole wheat flour and subbed chocolate chips for the blueberries. They are amazing!!! Hard to believe these are healthier! made these this morning – half with strawberry and choco chips, half with shredded cheese. both were DELICIOUS !!! and both my kids (and husband) liked them! THANK YOU !!!! Hi! I love this recipe. I made it for the second time today and they turned out great except after baking for 20 min at 400 they were still gooey in the middle. This has happened both times! I double checked all my measurements and I followed yours exactly. Do you have any suggestions? I kept them in the oven longer but then the tops got too crunch. Any alternative to the all-purpose flour? 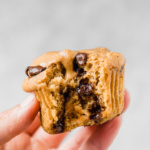 Can I use whole wheat flour for all of it? Or substitute it with coconut flour? HI Lisa! I wouldn’t recommend substituting flours here – the measurements are pretty exact and using all whole wheat flour will make them crumbly. Are these really that healthy? To me they are, yep! I notice it doesn’t say unsalted butter and the browning butter tutorial says it is with unsalted butter. I am probably overthinking which is what I do, but just for clarification I am using salted butter correct?